This is the text of the manual that comes with the Güth Wolftöter. It is presumably copyright to the manufacturer, and I feel justified in reproducing it here since I am selling the product. It should probably not be reproduced elsewhere without permission from the maker. Although rather stiffly translated from the German, this manual contains good information for anyone attempting to control a wolf note, regardless of whether they are using the Güth product or not. To buy this product please visit the wolf eliminators page. The wolfnote, that unsteady stuttering of specific notes on the lower string instruments, is a phenomenon that has only recently been explored. It is a result of the instability between the vibration of the body of the cello and the vibration of the affected string which then serve to cancel each other out. The note has barely begun to sound when it disappears. This is repeated again and again and results in the stuttering. The wolfnote is mainly found in the lower string instruments due to the fact that adjustments were necessary to increase the instruments’ volume. The old instrument builders mastered this, but the price we pay is the wolfnote. The wolfnote is therefore not the result of a basic structural failure, a faulty repair job, or a misplaced sound post, but, rather, it is an intrinsic characteristic of the instrument. Every properly proportioned cello has a wolfnote. Nevertheless, as every cellist can attest, the wolfnote can be very troublesome. All attempts to correct it have only resulted in either shifting the wolfnote into another frequency or have negatively affected the general sound of the instrument. One should especially be discouraged from attempting to correct the wolfnote by moving the sound post. The sound post has very little to do with the wolfnote - but much to do with the tonal quality of the instrument. Most importantly, it must be made clear that frequent moving of the sound post damages the instrument at its weakest point. Tonal quality should be the only deciding factor when positioning the sound post. An effective wolfnote damper must be constructed in a way so as to influence the wolfnote leaving the other notes unaffected, and, even then, it should only serve to minimize the stuttering. ln order to affect only the wolf frequency and to leave all other frequencies unaffected, the resonance principle has to be applied. This means that the resonance of the cello body which causes the stuttering must be counteracted by an anti-resonance which compensates the wolf`note. This is what the eliminator achieves. The eliminator consists in a small metal ball held by two springs, one on each side. When a note in any other frequency is played, the eliminator has no effect. However, as soon as the wolfnote is played, the eliminator starts resonating, countering the unsteady wolf stuttering and homogenizing the timbre in all neighboring frequencies. The wolf eliminator is produced for three frequency areas, described as tief (low), mitre! (middle) and hoch (high) on the package cylinder, corresponding to the colors yellow (low), green (middle) and blue (high) marked on one side of the metal ball as frequency indicators. Blue and green are the ones most often used. The correct choice of wolf eliminator depends, on the one hand, on the cello’s specific wolfnote frequency, lying somewhere between D- and F#; furthermore, it also somewhat depends on the type of the strings: the higher the tension of the strings, the lower the wolf eliminator must be (see Fig. 1). It is recommended to try out different ones and base your decision on the observed effect. Usually, yellow eliminators are most effective for wolfnotes from D to E; green ones for Eb to F, and blue ones for E to F#. The small device is hung between the bridge and the tailpiece, between the A and the C string (with the small color indication facing towards the A-string as indicated in Fig.2). Please ensure that the springs are not overstretched. It is recommended to use some thread as shown in Fig.2. Once the eliminator is in place you will possibly find that the wolf stuttering on the G-string will already have disappeared. But this should not leave you satisfied, since our goal is not only to get rid of the wolfnote but also to homogenize the whole frequency area in its vicinity. To achieve this, now play the wolfnote on the C—string and move the eliminator up and down on the strings (without damaging their windings!) until its optimal position has been found, i.e. until the stuttering has not only disappeared on the wolfnote itself, but in neighboring frequencies as well. (You will find that the stuttering on the C—string cannot be totally eliminated; this is due to the fact that the eliminator was gauged for the G—string). lf you have located the position as described, then the stuttering on the G-string must now have totally disappeared, and the wolfnote as well as its surrounding area should sound homogeneous and be easy to play. The eliminator’s position does not have to be exceedingly exact. A couple of millimeters difference are no problem. Under normal conditions you will find that the device is placed 2 to 4cm away from the bridge. However, if, after having located the ideal position, you continue to observe that the stuttering on the G·string has still not totally gone away, this indicates that the position is too far from the bridge. ln this case you need to use a lower-frequency eliminator (see Fig. 1) whose optimal position is then closer to the bridge and can thus be more effective. 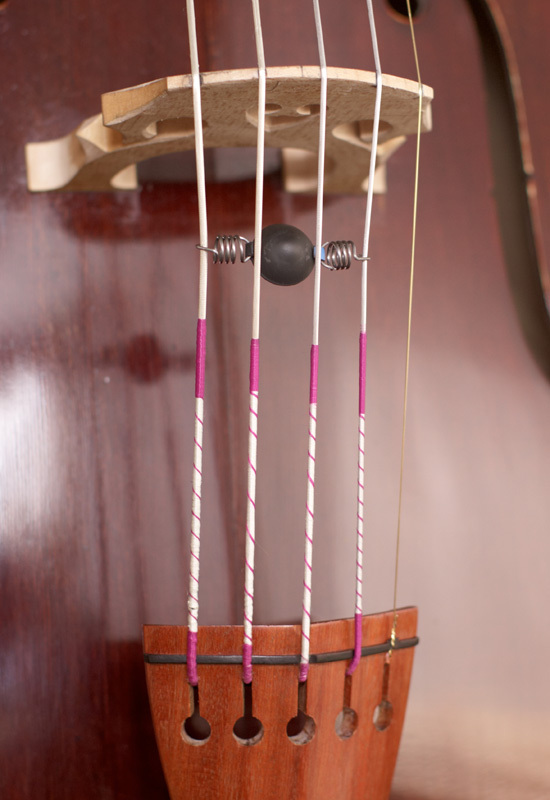 Once you are sure to have found the ideal position, you can use two drops of glue to fix it onto the strings. 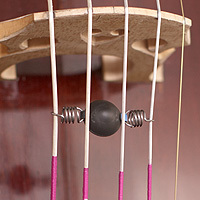 Please note that, apart from this "eliminator" there is also another damper which we call ”resonator’ lt works according to the same principle, yet it is- not attached to the strings, but glued to the inside top of the instrument instead. The "resonator” does not require posterior adjustment since it is tuned exactly to the corresponding wolfnote.